Everyone knows the songs from The Wizard of Oz; in fact, Over the Rainbow is often cited as the greatest movie hit of all time. Few, however, know the names of the men who wrote Rainbow and the rest of the classic Oz score. The remedy for their anonymity now is in the hands of Aaron Harburg — great-grandson of The Wizard of Oz lyricist E.Y. 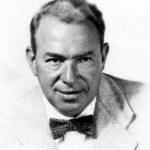 “Yip” Harburg — who has begun production on The Song of the Century. Previous PostRICHARD HOLBROOK AT 54 BELOWNext PostWho Put the Rainbow in the Wizard of Oz?